Ever since I played the first demo of Lucky’s Tale, I’ve been convinced that third-person platform games are a surprisingly perfect fit for virtual reality. 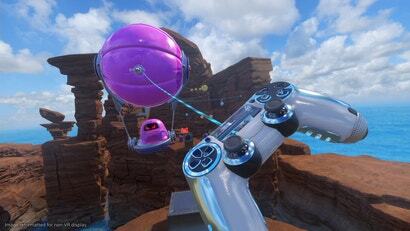 It’s fun to play a platformer when you’re enveloped in the world itself. It’s more thrilling to make your character jump off a high cliff when you yourself can feel the height of the drop, even if it’s not “you” taking the plunge. 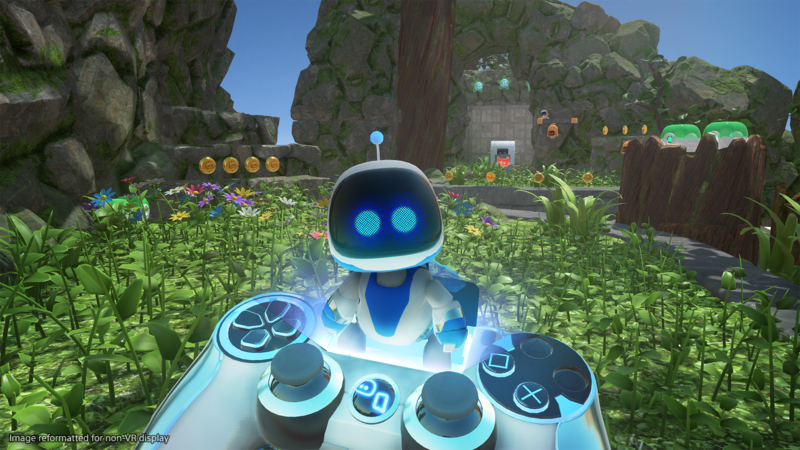 Sony’s Astro Bot Rescue Mission for PlayStation VR is the latest virtual reality platformer, and it’s got a lot going for it - a shiny and cute Mario Galaxy-style aesthetic, catchy music, diverse level designs, massive boss fights, and a lot of cool VR tricks. It can be a lot of fun, but also pretty annoying—especially if, like me, you want to find everything in each level. Astro Bot is a straightforward mascot platforming game starring the little robots from Sony’s early VR Playroom demos. Their spaceship has been busted up and the robots on board have been scattered to five different planets. It’s up to one brave robot (and you!) to rescue them and rebuild the ship. You run and jump through the levels, which are laid out in straight lines in front of you, sort of like Crash Bandicoot. Some enemies will attack “you” and not the little robot—an octopus might spit ink into your eyes, a Bullet Bill-style enemy might smash into you and “crack” your screen, etc. The fact that you’re viewing the game through the eyes of a second robot lets the game do some interesting things with camera angles. Sometimes the platforms that Astro Bot is jumping on are right in front of you. But sometimes they’re off to the side. Or high above you. Or far below you. Even behind you. In those moments, which are plentiful, you have to move your head, your neck, even your body to adjust your view and see where Astro Bot is going. At first, I found this to be a charming, clever use of VR. Right at the beginning of the first level, I looked to my left and saw a series of platforms that Astro could jump on, which I couldn’t see before. But then I craned my neck to see more of the platforms - and there was a hidden coin behind a pillar! You couldn’t see it unless you were making an effort to really examine everything. You really do need to look around as you move through these levels, because each level hides eight of your robot pals. They’re usually tucked away in an areas you can’t see by looking straight ahead. You need to find a decent number of them to unlock new levels, and, well, even if you didn’t, I’m the sort of person to whom the phrase “find eight hidden robots in each level!” is an irresistible dare. 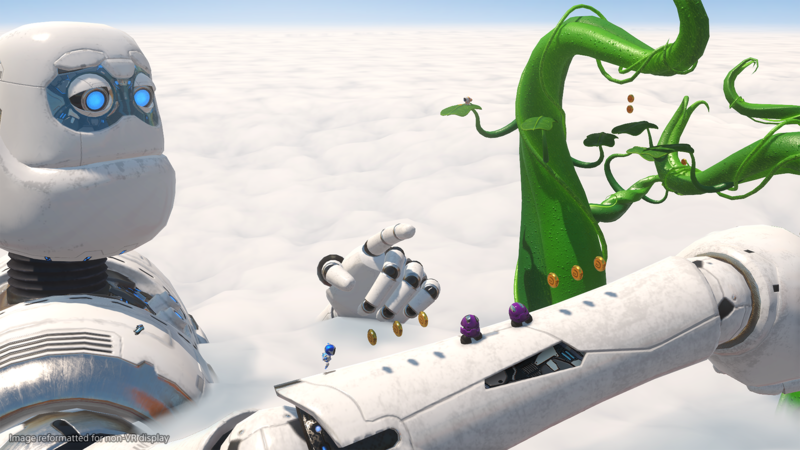 I didn’t go to the next level in Super Mario 3D World until I had all three green stars from the previous one, and I sure as heck wasn’t going to go to the next Astro Bot level without all my buddies. I missed a couple in the first level, then played it again more carefully, and got them both. Then I went to World 1-2. I really didn’t feel like playing every level twice; their charm wears a little thin once you know what’s coming, and the linear, slow-paced progression means that you’re pretty much doing the same thing for a second time without much chance to improve or play more efficiently. So, for World 1-2, I took my time. I looked everywhere. I’d advance the camera a bit, then crane my head around 360 degrees. I found 7 of 8 robots, and spent what had to be a good half-hour sitting there in VR just endlessly checking over one tiny slice of the level where the final bot had to be, finding nothing. At this point, I was a) sick of having a VR headset on and b) totally out of ideas. Where was this fucker? Out of desperation and a desire to just move on, I turned to the internet, where I found… many other people having no idea where the last robot was. Spoiler time: Apparently, at one very specific moment during the level, an aeroplane flies overhead, and if you look at that aeroplane, there’s a symbol on it that indicates that you can throw a ball at it. So what you had to do is carry a ball from a different part of the level to that point, and you had about one second to throw it at the plane. This, I felt, was ridiculous. The game had given no indication that any of the robots would be time-limited, or that they might disappear. The rest of the ones I’d found had been standing stock-still and could be collected at any time. Moreover, part of the nature of a VR game is that the game cannot control your field of view and force you to look at the plane, meaning that it would be extremely easy to never even see it, especially since you’re trying to run Astro across a platform when it flies by. Anyway, I had the final robot now, and moved on to World 1-3. My excitement to hunt for all the bots had been replaced with something close to anxiety. Since you can’t scroll the camera backwards, you could easily miss one of the robots just by walking a tiny bit too far. So now I was creeping forward bit by bit, advancing the camera a little, cranking my head all around me, then repeating the process. My neck began to hurt. There’s an old game design truism that says if the most efficient way to play your game is boring, your game is boring. I would rewrite that for Astro Bot: if the most efficient way to play your game gives the player neck pains, your game is a pain in the neck. Eventually I realised that if I was going to have any fun and/or not injure myself, I was going to have to give up on finding all the robots. Sure, if I saw one, I’d get it. But I wasn’t going to replay any levels or spend an inordinate amount of time trying to find the last ones. At that point, I found I could mostly just concentrate on what was good about Astro Bot. The levels are designed quite smartly, in the way they make use of the sense of scale that VR imparts: the height of an enemy, the distance between you and Astro, the beauty of a scene on the horizon. Astro himself is adorable (he even dances the Carlton when he wins a level). Even if you’re not worried about rescuing all the robots, Astro Bot has got some issues—I found several design decisions baffling, although a lot of my gripes were mitigated by the fact that the game gave me infinite lives and generous checkpoints. 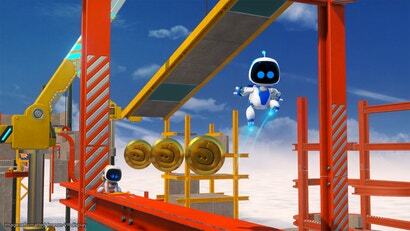 All that taken into account, Astro Bot was a real rollercoaster, complete with the risk of whiplash. It’s another solid piece of evidence that VR platformers can work, even if it takes many more iterations before they’re ready for prime time.